Thanks to an Erasmus + fellowship I was able to join the project Interwoven (https://www.vam.ac.uk/research/projects/interwoven) as V&A visiting fellow (March to May 2017) to collaborate in the study of medieval textiles and ecclesiastical vestments related to the Iberian Peninsula at the Museum. In this blog entry, I would like to underline the relevance of some of these pieces to a wider discussion of the role of textiles within 11th and 12th-century ecclesiastical reform in Spain. Material culture has been largely overlooked as shaper of ecclesiastical ideals in the debates on the so-called “art of the Gregorian Reform”. Fortunately, the contributions of M.C. Miller have focussed on ornamented vestments as a sign of distinction for the reformed clergy in the High and Central Middle Ages. Together with studies by M. Castiñeiras on the “Creation Tapestry” of Girona, they constitute a fortunate exception to the above-mentioned historiographical gap. Yet the outstanding textile heritage of the Iberian Peninsula offers much potential for study. Fig. 1. 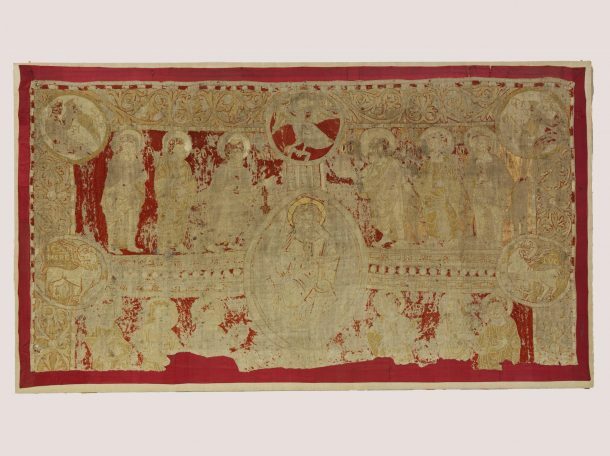 Embroidered altar frontal, linen and silk , V&A 1387-1904 (© Victoria & Albert Museum, London). Rich textiles fulfilled an essential mission for the ecclesiology of Gregorian Reform since they emphasised the sacredness of the altar through their spectacular display. Catalonia had some of the most remarkable examples of altar cloths of this period. One of them, the embroidered antependium possibly from La Seu d’Urgell (Fig. 1) has been preserved at the V&A since the early 20th century. Textile magnificence also contributed to promoting new cults in the religious landscape of Iberia. The exaltation of the holiness of the clergy was one of the main objectives in the reformers’ agenda, and many holy prelates were surrounded by remarkable textile goods. 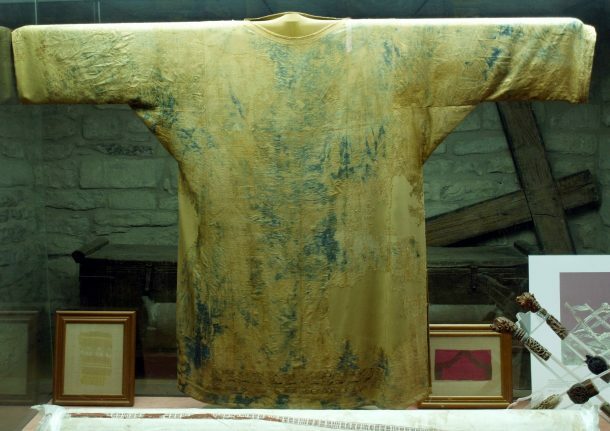 For example, the funerary vestments of bishop Saint Ramón of Roda de Isábena (†1126), a leading figure of Church reform in Aragon, are particularly noteworthy due to the number and completeness of the items (Fig. 2). Pieces like these raise serious methodological problems due to their complicated biography. For these reasons, the hypotheses that are elaborated around them have to be formulated with great prudence. Ecclesiastical sees, such as the above-mentioned Roda de Isábena and La Seu d’Urgell, have preserved a rich textile heritage linked to the worship of their reformer saints. The promotion of their cult favoured the creation of novel typologies and iconographic programmes in ecclesiastical institutions. Such could be the case of the V&A’s frontal (Fig. 1) and the so-called banner of Saint Ot (†1122) at the Museu del Disseny of Barcelona if, as pointed out by L. Monge, both were created for the worship of that holy bishop and were shown together in exceptional events celebrated at the cathedral of La Seu d’Urgell. Beyond visual discourses, the prominence that clerical patrons accorded to textiles also reveals that their material qualities were markers of status. Material quality and technical refinement were distinctive features of the textiles manufactured and traded in al-Andalus that spread across Iberian and European markets, as the V&A textile collection shows. The re-use of textiles appreciated for their craftsmanship and materials was a common fact within the medieval cult of relics that explains the size of some of the V&A medieval textile fragments, such as V&A 1254-1864 (from the Cathedral of Sens in France) or V&A 7051-1863 (possibly from the Cathedral of Cologne in Germany). 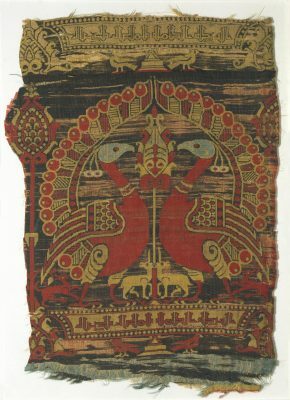 Several silks used in ecclesiastical vestments or as relic wrappings in these decades share design and weaving features that have led scholars to ascribe them to Andalusi or Iberian centres of production. In particular, certain patterned textiles decorated with roundels housing paired animals or human figures have been traditionally linked to Almería, a flourishing textile centre between the 11th and 12th centuries. That would be the case of V&A 828-1894 (Fig. 3), cut from a cope in Saint-Sernin in Toulouse or the shroud fragments of Saint Peter of Osma (El Burgo de Osma, Soria), whose tunic has also been preserved. Like Saint Ramón of Roda or the 12th-century Aquitanian bishops of Sigüenza – another Castilian see that conserves textile fragments of this nature –, Saint Peter of Osma (†1109) belonged to the group of French prelates who headed Iberian bishoprics after the Gregorian Reform. Perhaps it is no coincidence that these figures were related in one way or another to the use of textiles of supposedly similar provenance. These pieces were linked to influential leaders and renowned saints who played prominent roles in the reform of the Iberian Church in the Central Middle Ages and who were appropriately dressed in silks. The material splendour of this finery would have satisfied their wearers’ desire for holiness. It seems that Andalusi textile production of the 11th and 12th centuries provided an appropriate vehicle for shaping some of the interests of the Iberian reforming ecclesiastical elite. In my opinion, this phenomenon parallels the importation of Byzantine fabrics in other areas of Europe for similar uses, as discussed by M.C. Miller. Undoubtedly, the conditions created by the availability of this material in Iberian markets and the fluidity of commercial interchange played a fundamental role in this dynamic. Moreover, these networks extended well beyond the limits of the Iberian Peninsula. Iberian silks were indeed used for ecclesiastical vestments in places like the above-mentioned chapter of Saint-Sernin in Toulouse (Fig. 3), from where Saint Ramon of Roda came, in other French regions or even in Italy, although it cannot be concluded that this happened in the chronological framework that I have dealt with in this blog entry. Acknowledgements: Some of these ideas were discussed in a work-in-progress seminar held in the Research Department at the V&A and will be the subject of a longer forthcoming article. This work is part of the national Spanish research project “Las manufacturas textiles andalusíes: caracterización y estudio interdisciplinar” (HAR2014-54918-P) and benefited from an ARTES Coll y Cortés Postdoctoral Research Scholarship. Cabrera Lafuente, A., Feliciano, M.J. and Parra,E., forthcoming: “Medieval Iberian Relics and their Woven Vessels: The Case of San Ramón del Monte (†1126), Roda de Isábena Cathedral (Huesca, Aragon)” in Proceedings of the Relics @ The LAB. International Workshop (Brussels, KIK-IRPA, 27-28 October 2016). Castiñeiras González, M., 2011: The Creation Tapestry, Girona. Feliciano, M.J., 2014: “Medieval Textiles in Iberia: Studies for a New Approach” in D. Roxburgh (ed.) Envisioning Islamic Art and Architecture. Essays in Honor of Renata Holod, Leiden-Boston, pp. 46-65. Miller, M.C., 2014: Clothing the Clergy. Virtue and Power in Medieval Europe, c. 800-1200, Ithaca-London. Monge Simeón, L., 2014: “El estandarte y el frontal de Sant Ot: ¿el ajuar del santo obispo de la catedral de la Seu d’Urgell?”, Anales de Historia del Arte, vol. 24 (special issue), pp. 9-25.